In May, Uruguay unveiled the detailed rules for its non-medical market, and guidelines for the new medical marijuana system are likely to be published this summer. Regulated marijuana production and sales are anticipated to begin in late 2014 or early 2015. Uruguay’s leaders stress that their effort is meant to address their own particular circumstances, and not serve as a model for export to other countries. In an address to the UN Commission on Narcotic Drugs in Vienna in March 2014, President Mujica’s chief of staff, Diego Cánepa, said that though his country has chosen to combat drug trafficking through regulation of the marijuana market, “We don’t believe in, nor want to be, a model for anyone.” Nonetheless, if Uruguay can enact and implement such legislation—in the face of harsh criticism from the International Narcotics Control Board (INCB), but pronounced silence from the United States—then so too can other national governments. At the same time, Uruguay’s leaders are conscious of their pioneering role, and ask that other governments respect their country’s new approach. In response to outrageous assertions by INCB President Raymond Yans that Uruguay was behaving like a “pirate” nation, Mujica’s government has countered that the new law is entirely consistent with the original spirit of the UN drug treaties to promote the “health and welfare of mankind” and is aligned with Uruguay’s fundamental human rights obligations. To date, the state-level legalization laws approved in the United States have been the result of ballot initiatives. By contrast, Uruguay’s law was the outcome of deliberations within the national legislature. Moreover, the law was enacted not on a wave of public support, but despite polls showing that most Uruguayans do not support the initiative. President Mujica and lawmakers of the Frente Amplio (Broad Front) Coalition were convinced that the time had come for a new approach to the drug problem, and used their political coalition’s majority control of both legislative chambers to make it a reality. Now, even with the law approved, most Uruguayans remain to be convinced. President Mujica and Frente leaders are hopeful that over time a majority will change their views as the law makes progress towards its key goals. Those goals include taking the marijuana market out of the hands of criminal enterprises; separating the legal marijuana market from the illegal market for more harmful substances; and reducing marijuana-associated health risks. The public’s continued skepticism means that solid implementation and evaluation of the new law will be crucial to its political sustainability. 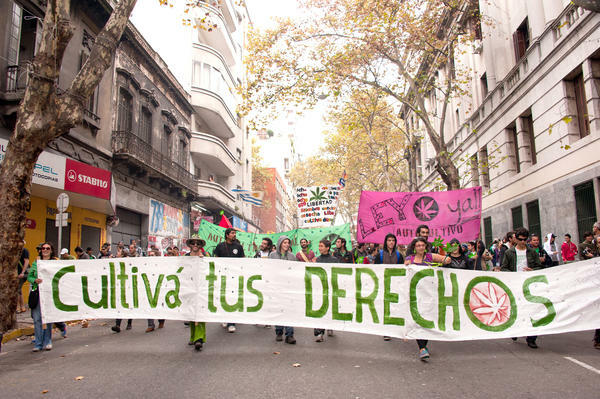 The marijuana policy debate was not new to Uruguay when its leaders decided to pursue reform; progressive social attitudes have long shaped the country’s drug policies. The personal possession of “a reasonable quantity, intended solely for personal use” of all drugs was decriminalized in 1974. Jorge Batlle (2000-2005) was Uruguay’s first president to broach the possibility of marijuana legalization. While the proposal made no headway in the legislature, civil society began mobilizing. The youth wings of multiple parties of the Frente coalition called for legalization and got drug policy reform included in the Frente’s official 2008 agenda. In 2010, the first bill that would permit home cultivation of marijuana plants for personal consumption (autocultivo) was presented in Congress, but the bill included other provisions that prevented it from advancing. and Spain’s cannabis social clubs. After extensive deliberations, the original bill was expanded to encompass 44 articles. The core provisions allow for four forms of access to marijuana: medical marijuana through the Ministry of Public Health; autocultivo of up to six plants per household; cannabis social clubs where no more than 45 members can collectively cultivate up to 99 plants; and licensed sale in pharmacies of up to 40 grams (around 1.5 ounces) of marijuana per month to registered Uruguayan residents age 18 and older. The bill establishes an Institute for the Regulation and Control of Cannabis (IRCCA), charged with licensing producers, authorizing home cultivation, and maintaining a registry of growers and membership clubs, among other responsibilities. The bill prohibits advertising and includes penalties for sales to minors, driving under the influence, and unauthorized production. National health and education systems are required to provide treatment for and education on problematic drug use. But even as the bill was taking form, public support for the proposal was lacking. In a July 2012 poll, shortly after Mujica’s announcement, 66% of Uruguayans opposed the initiative. Six months later disapproval remained high, at 64%. In early 2013 Mujica put the bill on hold for three months, announcing that more time was needed to build public support. A February 2013 workshop in Montevideo—organized in collaboration with the Drug Policy Alliance and the Washington Office on Latin America (WOLA)—brought together key Colorado and Washington campaign leaders with Uruguayan government officials, legislators, and civil society representatives to share ideas about building a successful public education campaign in Uruguay. Insights from the workshop sparked the creation of Regulación Responsable, a broad coalition of trade unions, doctors, musicians, lawyers, athletes, writers, actors, academics, and students alongside organizations promoting LGBT rights, women’s rights, health, and the environment. Regulación Responsable held public events and launched a national TV ad campaign—featuring a mother, a doctor, and a lawyer explaining the measure’s benefits—which reached hundreds of thousands of Uruguayans. The campaign projected three key messages. First the legislation would strengthen public safety by separating marijuana users from more dangerous drugs. Second, it would improve public health by allowing access to quality-controlled medical marijuana and by investing the resulting tax revenue in education, treatment, and prevention of problematic drug use. And finally, it would resolve a legal contradiction whereby consumption was legal but all access to marijuana was illegal, a situation that fed the black market and enriched criminal organizations. But the Frente still had to contend with dissent within its own coalition. Since the bill’s inception, two coalition lawmakers had expressed misgivings regarding the potential risk of increased marijuana use among youth. The Frente agreed to add provisions obliging schools to include education on the risks and harms of drug use in their curricula. These two votes ultimately secured the bill’s passage in the House on July 31, 2013. A week after the House vote, former president Tabaré Vázquez, who is expected to win the presidency again in October 2014 elections, explicitly agreed “with the proposed bill that lawmakers approved,” dispelling lingering uncertainty over his support for the project. Vásquez’s public approval made it clear that final passage would be essentially a matter of time. Moreover, even as polls continued to show that most Uruguayans opposed the measure, the support among Frente voters was on the rise. On December 10, the Senate passed the unmodified bill with 16 out of 29 votes. Passage of the law is merely the first step. The nuts and bolts of effectively regulating the marijuana market and a largely unconvinced public make implementation a real challenge. But Uruguay does have several advantages, including its small size and small population, as well as the fact that Uruguayans give their government relatively high marks on its ability to address key problems, including crime, corruption, and poverty. Not only is the Frente likely to retain control of the presidency in the October 2014 elections, it also has a chance to maintain its majority in both houses of the Congress. Such continuity would help ensure political space for the coalition to candidly acknowledge and address the problems that will surely appear as the marijuana regulation law is put into effect. As Uruguay enters uncharted territory, the most important attribute the country possesses may be a political system and governing coalition responsive enough to learn from experience and adapt to changing circumstances. Hannah Hetzer is policy manager of the Americas at the Drug Policy Alliance, based in New York. John Walsh is Senior Associate for Drug Policy at the Washington Office on Latin America (WOLA).